>RedHawks Move On To Motown! For those of you that watched the Miami RedHawks defeat the Michigan Wolverines in a double overtime thriller on Sunday night, there’s no need to recap it here. You know the story. 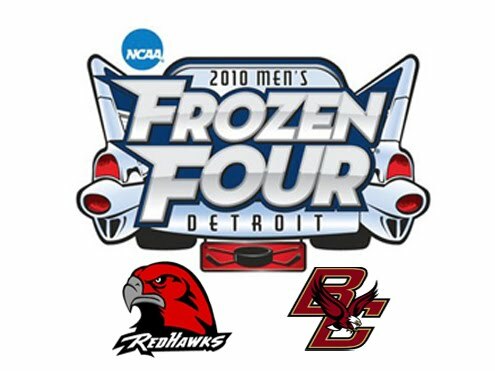 The ‘Hawks now move on to the Frozen Four for the second straight year and will take on “tournament rival” Boston College on April 8th at 8:30pm ET at Detroit’s Ford Field. The Eagles advanced by beating Yale on Sunday, 9-7. Check back on the blog in the next week or so for an in-depth preview of the Miami/BC matchup. Wisconsin and RIT are also Detroit bound after their wins this weekend. – Defenseman Vincent LoVerde missed this weekend’s games because he is currently hospitalized due to an “unfortunate situation.” It’s unclear at this point if he’ll be available for the National Semifinals. – Connor Knapp was spectacular. He made 55 saves on Sunday night and the Miami defense played well in front of him. In my opinion, Connor deserved to play that game and he showed why. – Rico: Has anyone who has followed this program for any length of time EVER seen the man that emotional? No way. – Boston College goaltender John Muse has allowed 14 goals in the last three games, seven of them coming against Yale in the 9-7 BC win on Sunday afternoon. 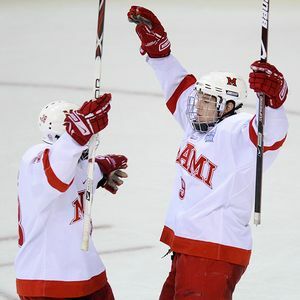 >Coming into the NCAA Tournament, the Miami University men’s hockey team had one thing on it’s mind- redemption. After nearly winning the 2009 Division 1 Championship last April, only to lose in heartbreaking fashion to Boston University, the RedHawks were looking to get back to the “Frozen Four” almost a year later. Having earned the number one overall seed, Miami drew a first round matchup with the University of Alabama-Huntsville Chargers and never looked back, advancing to the regional finals on Saturday with a 2-1 win in Ft. Wayne, Indiana. In the first period, Miami came out running like a well-oiled machine, playing the physical, skilled, and defensively sound brand of hockey that kept them at the top of the major polls all season long. The scoring chances were numerous for the red & white, but good shot blocking and a few big saves from UAH goaltender Cameron Talbot kept the game tied in the opening minutes. Unhappy with his team’s performance on the powerplay, Miami bench boss Enrico Blasi changed his strategy on the man advantage. Good coaching, combined with the Chargers’ inability to stay out of the penalty box ended the stalemate midway through the first period. Miami junior Carter Camper, who was”camped” behind the Alabama-Huntsville goal, made a perfect feed to the front of the net and found freshman Curtis McKenzie waiting at the top of the crease to bury the one-timer. The powerplay tally was McKenzie’s sixth goal of the season and first of the tournament. It was the only marker in the first period. After the first twenty minutes, it was much of the same. Alabama-Huntsville continued the march to the penalty box, giving the RedHawks a few key chances to add to the lead. They did just that. Curtis McKenzie carried the puck into the offensive zone along the right half wall and threw it in front of the net. The pass found the stick blade of Miami defenseman Cameron Schilling, who awkwardly lifted the puck into the air and watched as it fluttered over goaltender Talbot to put his team up 2-0. Like the first goal, this was scored on the powerplay and was Schilling’s fourth of the season. The same tempo seen in the first 40 minutes carried over into the third period. Miami held onto its two-goal lead for 19:22 of the final stanza. A late penalty on Miami’s Chris Wideman with 2:24 remaining put the Chargers on the powerplay. A lazer of a shot by UAH defenseman Brennan Barker found the twine over the right shoulder of Miami goaltender Cody Reichard and the lead was cut to one with just 38.3 seconds remaining in regulation, but it wasn’t enough, as Miami defeated Alabama-Huntsville 2-1 and outshot the visitors from the Yellowhammer State 38-17. The RedHawks will face the University of Michigan Sunday night at 8pm, with the winner advancing to the NCAA Frozen Four in Detroit, Michigan. Michigan defeated Bemidji State 5-1 on Saturday evening to advance. Miami was 2-1 against the Wolverines this season, with both wins coming at Yost Ice Arena in Ann Arbor. > Many of you diehard college hockey fans have no doubt heard about the University of Alabama-Huntsville Chargers, but the majority of the publicity that UAH has gotten lately has been less than encouraging. Throughout the program’s existence, UAH has been a part of the soon to be defunct College Hockey America (CHA). For now, the Chargers are in essence “homeless,” without an official conference to play in next season and an independent schedule in front of them. With Nebraska-Omaha’s departure from the CCHA creating an open slot, UAH applied for membership, and received a “thanks but no thanks” reply from the league and commissioner Tom Anastos. Most certainly down, but not out, the Chargers are writing a new chapter in their program’s history, winning the final CHA Championship and making the NCAA Tournament as an Automatic Qualifier. Up front, UAH has forwards Cody Campbell and Andrew Coburn. Campbell, a sophomore and Coburn, a junior are both 22 point scorers. Campbell has 8-14-22 on the season and Coburn is an assist better than his teammate, notching 7-15-22. Separating these two players gives the Chargers the ability to roll more than one line, as Coburn usually centers a line with Kevin Morrison and Chris Fairbanks. Campbell plays on the right wing with Neil Ruffini in the middle and Sebastien Geoffrion on the left side. The RedHawks will need to keep an eye on these two lines, especially Ruffini’s. The bread and butter within the Chargers game resides on the blueline and on special teams, particularly with the penalty kill, ranked 4th in the nation. On the blueline, there are a good mix of underclassmen and “veterans”; seniors with NCAA tournament experience. Unlike the RedHawks, UAH has a definitive number one goaltender in Cameron Talbot. No platoons here. The junior has recorded the decision in every one of the Chargers games this season and has a record of 12-17-3 with a 2.62 GAA and a .924 save percentage (which ties him for 5th in the nation with our own Cody Reichard). Backup ‘tender Blake MacNicol has only seen action in two games and has no record. For Miami to advance, staying out of the penalty box and running a physical game are both very important. The RedHawks definitely have the size advantage in this matchup, and will rely on that physicality to carry the tempo. Prediction: UAH is a great story, but doesn’t have the depth that the RedHawks do. Many say this is a “trap game”; a 4-1 matchup, but I think the skill and experience win out. Miami advances, 4-2. Detroit, Mich. (March 19) – The CCHA season has hit its annual end point with the four remaining teams congregating in Detroit for the final weekend of CCHA play. This weekend, three of the top four seeds made it to the Joe for the CCHA Championships including top seeded Miami and #7 seed Michigan who play tonight at 8pm on the Big Ten Network. #3 Ferris State and #4 Northern Michigan will meet in the first semifinal with the winner advancing to the championship game against either Miami or Michigan. Miami and Michigan have faced each other twice already this season with Miami sweeping the Wolverines in Ann Arbor 3-1 and 5-1. But, as they say, that was then, this is now. These Wolverines are 6-2 over their last eight games and just completed a two game sweep of arch rival MSU in East Lansing to earn a berth in the finals weekend. By most accounts, the Wolverines must win the tournament to keep their 19-year streak of NCAA tournament appearances alive. They are playing fast. They are playing smart and strong in front of walk-on goaltender Shawn Hunwick who is 5-1 since taking over for the injured Bryan Hogan. But, Hunwick has yet to face a team as talented as Miami and certainly not under the hot lights of Joe Louis Arena. Meanwhile, Miami enters tonight’s game secure. They are in the NCAA tournament, but they’d like dearly to hold onto either the #1 overall seed, or at worst, #2 by performing well this weekend. Plus, Miami has never captured the Mason Cup, a feat this team wants badly to accomplish. Miami has talked about three championships all season. They have the first, the CCHA regular season title. The second is two wins away and the third begins next weekend. Can they do it? Here’s what College Hockey News had to say about the weekend. Miami has never fared well against Michigan, nor in Joe Louis Arena. I’m optimistic, but won’t be surprised either way. I’m out. Heading for Detroit. Detroit, Mich. (March 18) – The Miami RedHawks, already owners of the 2009-10 CCHA regular season title, took home nearly every individual award at tonight’s CCHA awards banquet held at Detroit’s Fox Theatre. Tommy Wingels – The junior was named captain of the RedHawks at the beginning of the season and was tonight named the CCHA’s Best Defensive Forward. Wingels was +12 in CCHA action consistently seeing time against the opposition’s number one line. Will Weber – Sophomore and CBJ draft pick Weber was honored as the CCHA’s Best Defensive Defenseman. Weber is 6’4″ and 200 pounds and will be solid contributor for the Blue Jackets. He has a smooth skating stride and is very fast for such a big man. What’s more? Weber has a mean streak to go along with that size and is a big hitter. Enrico Blasi – Miami’s head coach was named the CCHA’s Coach of the Year for the fourth time in eleven seasons at Miami. Blasi led the RedHawks to their third CCHA regular season title with a remarkable 21-2-5 conference record including a 23-game unbeaten streak in league play. Congratulations to the RedHawks! Now bring home the Mason Cup! Oxford, Ohio (March 12) – Led by two goals apiece from Carter Camper and Andy Miele, the top seeded Miami RedHawks overcame a one-goal first period deficit to defeat Ohio State 6-2 in a CCHA second round tournament game at Steve Cady Arena. Miele would get the RedHawks on the board first before Ohio State’s Hunter Bishop would score his fourth and fifth goals in the last two games as the Buckeyes took a 2-1 lead into the dressing room at the end of 20 minutes. But Camper would tie the game for Miami just 17 seconds into the second period on a one-timer from Miele and get the game-winner on the powerplay a few minutes later firing up the better-than-expected crowd of 3,141 at the Goggin Ice Center (Miami students are still on spring break). The RedHawks would score twice more in the second period to turn a 2-1 deficit into a 5-2 lead heading into the final stanza. On the night, Miele had 2 goals and 2 assists for his third career four point game while linemate Jarod Palmer had a goal and an assist. Junior captain Tommy Wingels chipped in with two assists and added a massive, clean open ice hit on OSU assistant captain Peter Boyd which resulted in a cheap retaliation spearing penalty to Wingels’ nether-region. After the intent to injure penalty was assessed, Boyd was escorted to the locker room and the Buckeyes did not muster much of a comeback even when awarded a late third period two-man advantage. After a slow start, Miami goaltender Cody Reichard made 26 saves and Buckeye netminder Dustin Carlson was pulled for the second consecutive start at Steve Cady Arena. Michigan 5, MSU 1 – Don’t look now, but maybe, just maybe, Michigan is about to turn it on. They overwhelmed their in-state rivals with three first period goals and rolled in front of super-sub Shawn Hunwick who is still manning the crease while Bryan Hogan recovers from a groin injury. I believe the Wolverines will have to win the CCHA Championship in order to make the NCAA Tournament for a 20th consecutive year. Ferris State 3, UNO 1 – Solid performance from the Bulldogs in shutting down one of the hotter offenses in college hockey. Northern Michigan 4, Alaska 3 – After jetting to a 4-0 lead, the Wildcats had to hang on to defeat the Nanooks in Marquette, Mich.
Niagara 5, Bemidji State 4 – With the Beavers loss, it means that the four-team CHA will likely get two teams into the NCAA tournament spoiling the hopes of an at-large bubble team from a power conference. Currently, Bemidji is 6th in the Pairwise Rankings. I find it highly unlikely they would slide far enough to miss out on an at-large bid. The Purple Eagles will go for the final CHA Tournament title tonight on home ice vs. Alabama-Huntsville. Quinnipiac 3, Union 2 – Why include this score, you ask? Because it took 5 OT periods for the Bobcats to pull out the victory in the longest game in NCAA history! The two teams meet again tonight in just a few hours. Oxford, Ohio (March 11) – For the first time since 2004, Miami and Ohio State will face each other in the CCHA playoffs. The RedHawks and Buckeyes will battle in a best-of-three second-round series starting tonight at 7:35pm with game two coming Saturday at 7:05pm, and if necessary, game three at 7:05pm on Sunday evening. Each game will be played at Miami’s Steve Cady Arena. With Miami’s students returning from spring break, tickets are still available for Friday night, however Saturday is a virtual sell out with possibly a few SRO tickets remaining. Friday and Saturday will mark the fifth and sixth times the two teams have faced each other this season. The RedHawks lead the season series 3-0-1 with the most recent meeting having occurred at Value City Arena on February 27 when the teams skated to a 0-0 tie. Miami has outscored Ohio State 16-4 this season including two shutouts of the Buckeyes. While the eighth seeded Buckeyes appear to be heavy underdogs this weekend, history has shown that top-seeded Miami is vulnerable after breaks and bye weeks, including when they have hosted second round series in the past. For instance in 2006-07, Miami finished third in the CCHA earning a first round playoff bye. The RedHawks completed the year at 24-14-4 and upset #1 seed New Hampshire in the first round of the NCAA tournament. Yet, the RedHawks were swept by Lake Superior in the second round of the CCHA playoffs in Oxford. Last season, Miami finished 23-14-5, tied for second in the league, and came within a minute of the school’s first national title. Yet, after securing a first round CCHA playoff bye, the RedHawks were defeated in three games by Northern Michigan and once again sat on the sidelines instead of playing for the CCHA championship and the Mason Cup. And, earlier this year, Miami was swept by lowly Robert Morris after a lengthy holiday break. What’s this all mean? It means the RedHawks can be beaten by Ohio State if history is any predictor of future performance. However, that same pattern of struggling in the second round tends to occur every other year. This year? The pattern indicates Miami should win the series and advance to the CCHA semifinals at Joe Louis Arena in Detroit, Mich. But, certainly Miami’s history is worth noting. But, unlike past seasons where Miami has played a home series to a partially full building (due to spring break) and less than thrilling opponents like Northern Michigan and Lake Superior State, this season, Miami plays their chief in-state rival and the students will be back to fill up the building on Saturday night. Perhaps Miami has fallen victim to a two-week break followed by an opponent that hasn’t always been an emotional motivator. Perhaps Miami simply plays down to competition at times. But, that won’t be the case with an key rival coming to Oxford. Miami should be sky high for this series and will gain an additional edge if they can get through Friday’s game with a less than full student section. I think Miami sweeps the series and advances to the Joe. Miami has dominated the Buckeyes recently going 11-1-2 in the past 14 games. Miami leads the all-time series with Ohio State 61-56-12 including 38-21-4 in Oxford. Miami is 5-2 against Ohio State in CCHA tournament play with the last meeting coming in the CCHA semifinals in Detroit in 2004. That year the Buckeyes won three overtime games in three days to capture their only Mason Cup when the CCHA still utilized the “Super Six” format. Miami has won 20 or more games for five consecutive seasons and was 21-2-5 in CCHA play this season alone. Detroit, Mich. (March 11) – Earlier this week, the CCHA announced its all-league teams and finalists for individual awards. Coming off a dominating regular season, several RedHawks were honored headlined by senior Jarod Palmer and sophomore Cody Reichard joining Ohio State forward Zac Dalpe by being named to the CCHA’s first team. Palmer led the RedHawks in goals (16) and points (40) this season while Reichard led the CCHA in nearly every goaltending category as well as being the national leader in goals-against average (1.48), save percentage (93.8) and winning percentage (17-2-3 overall). In addition, junior captain Tommy Wingels and classmate Andy Miele were both named to the league’s second team while Carter Camper earned honorable mention. Lastly, freshman defenseman Joe Hartman was named to the CCHA all-rookie team after a year in which he played in 35 of 36 games registering 14 points on six goals including two short-handed. Importantly, Hartman was fourth on the squad in plus-minus with a +20 rating and helped the RedHawks lead the nation in scoring defense at 1.72 goals per game. Zac Dalpe led Ohio State in goals (20) and points (40) in being named to the CCHA first team and a finalist for Player of the Year. After a stellar freshman year, Dalpe broke out this season and led the Buckeyes from start to finish. He has been the only consistent scoring threat OSU has had this season. In addition to the team awards, the individual finalists were named. Cody Reichard was named a finalist for CCHA Player of the Year along with Dalpe and Northern Michigan defenseman Eric Gustafsson. Tommy Wingels was nominated for Best Defensive Forward and Miami sophomore defenseman Will Weber (CBJ draft pick) was nominated as Best Defensive Defenseman (the league splits this into two honors to give more attention to defenseman who are sometimes overlooked in awards presentations). Lastly, Miami head coach Enrico Blasi was named a finalist for CCHA Coach of the Year, an honor he has won three times previously. Michigan at Michigan State – In a rare second round meeting, the Wolverines will invade their arch-rivals in East Lansing. The good news for the CCHA is that at least one of these teams will advance to the Joe next weekend helping boost attendance. Michigan must likely win the CCHA tournament in order to make the NCAA tournament for the 20th consecutive year. I think the Wolverines advance because they are more talented, but MSU has had Michigan’s number recently. Alaska at Northern Michigan – The Nanooks hit the road again to play an interesting series in Marquette, Mich. NMU has played their best hockey historically during the second half of the season and they are doing it again this year. Walt Kyle almost always has the Wildcats in Detroit and I think that happens again. Nebraska-Omaha at Ferris State – Dean Blais has the Mavericks flying but they’ll be in for a stern test traveling to Big Rapids, Mich. to face the Bulldogs. I think this series goes to three games with Omaha moving on to Detroit. Columbus, Ohio (March 6) – Led by senior forward Mathieu Picard’s two goals, eighth seeded Ohio State defeated nine seed Notre Dame 3-1 in front of 734 strong at the OSU Ice Arena. As is the case annually, the Buckeyes are forced to play a home playoff series at the old barn adjacent to St. John Arena rather than their usual plush home digs at the Schott due to the Ohio High School Wrestling Championships having Value City Arena to themselves. Frankly, I believe the Buckeyes should play all of their games at the old building because unlike Value City, there is actually a college hockey atmosphere there and a real home ice advantage for Ohio State. The two teams play again at 7pm this evening and the game is purportedly sold out meaning 1,500 strong will cram into the facility to see if the Buckeyes can sweep Notre Dame and move onto the second round. With all of the upper seeded teams winning last night, it sets up the real chance that Ohio State and Miami could meet in Oxford in the second round of the playoffs for the right to advance to the CCHA Championship in Detroit in two weeks. Of course, this assumes that no lower seeded teams win the next two games to shake up the bracket. In addition to the Buckeyes game one win, all the higher seeded teams notched victories in the first night of CCHA playoff action. In Ann Arbor, Mich. seventh seeded Michigan behind seldom-used backup netminder Shawn Hunwick, defeated tenth seeded Lake Superior State 5-2. Hunwick was again subbing for injured junior Bryan Hogan and made 21 saves to get the win. Matt Rust, for whom the Blue Jackets traded Mathieu Roy, scored an unassisted goal just 37 seconds into the third period which turned out to be the game-winner. The Wolverines go for the sweep tonight at Yost Ice Arena at 7:35pm. In Fairbanks, Alaska, the fifth seeded Nanooks blanked twelve seed Western Michigan 4-0 behind 16 saves from Scott Greenham. Should the Broncos be unable to find a way to win tonight, it will be the last game behind the bench for outgoing head coach Jim Culhane. The Nanooks will attempt to sweep the Broncos at 11:05pm EST tonight from Fairbanks. Lastly, in Omaha, Neb., sixth seeded Nebraska-Omaha used four second period goals to chase Bowling Green starter Andrew Hammond from the net en route to a 6-1 whipping of the Falcons. Senior Jeremie Dupont made 25 saves for the Mavericks as Dean Blais’ troops continue to play well down the stretch. UNO goes for the sweep tonight at 8:05pm EST from Qwest Center. Denver, Colo. – With #15 Colorado College’s 2-1 victory over #1 Denver, Miami flipped a comparison with the Pioneers moving the RedHawks back into the top position in the Pairwise rankings that largely determine the NCAA tournament field. This means Miami would be the #1 overall seed in the tournament if the season ended today. Colorado College and Denver will play again tonight in Colorado Springs. Should the Tigers sweep the Pioneers, it will likely propel Miami back to the top of the national polls as well. Sometimes it pays to have a week off.